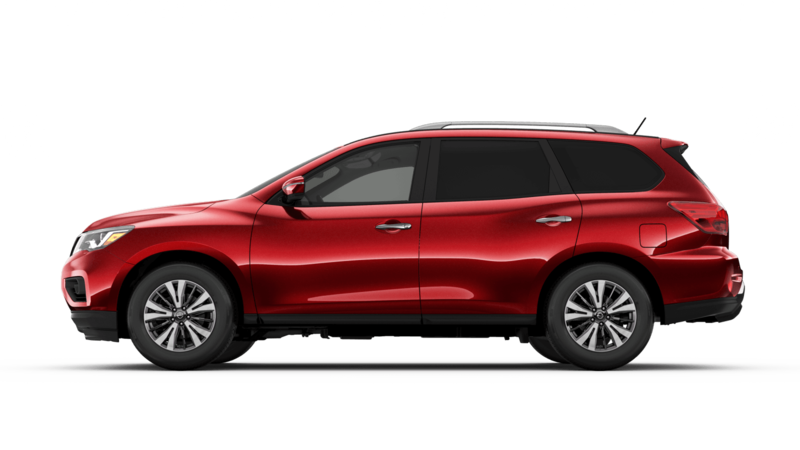 For the eighteenth year in a row Nissan introduces, it’s 2018 version of, the Pathfinder. This spacious, comfortable three-row seating SUV has a strong value proposition, comfortable interior, and standard safety technology that creates an enjoyable riding experience for the entire family. Starting at about $31,000 the S model comes with many impressive safety features. The top of the line platinum SUV is starting at $42,550 and comes with luxurious features. Also new in 2018, Nissan extends its special Midnight Edition to the Pathfinder. Calling People Responsible for Tiny Humans! AKA parents, and very involved aunts and uncles! Nissan caters the Pathfinder to fit your busy and hectic lifestyle. So it gave its drivers two very pro-parent features that will enhance your driving experience for safety. The Automatic Emergency Braking/Brake Assist comes standard on the Nissan Pathfinder. While it is not recommended to take your eyes off the road, sometimes our little ones force our attention. Nissan has your back and created a way to detect objects that might cause an accident by forcing an immediate stop. The next feature is new parents, favorite. The rear door alert will remind you to check the back seat before leaving your vehicle. If the vehicle detects the rear door was opened before a trip, but not open again after the vehicle was shut off, it will give you alert you to check the back seat for precious cargo. If you somehow (and don't worry, we aren't judging) miss the warning, the car horn will activate for another attempt to grab your attention. This happens to the best of us, that’s why Nissan included this feature standard. Built with Nissan’s VQ 3.5 liter v6 engine, the Pathfinder drives like the Altima yet behave as an SUV. With a combined MPG of 23, the V6 moves the Pathfinder with authority. This comes on top of other comprehensive sets of safety features. The Pathfinder has other optional Intelligent features Rear Cross Traffic Alert, Blind Spot Warning with moving object detection. The latter, with visual and audio, alerts the driver when objects are moving around the vehicle. The technology features extended to all the occupants of this vehicle. Charging everyone’s phones and tech gadgets won't be a problem because the new 2018 Nissan added four additional USB ports for a total of six. Another family-friendly optional feature is the Tri-tainment zone. Second-row passengers can be separately be entertained, with video games or laptop, all on their own dual 8.0" monitors. There is a headphone jack for each monitor. They can even mirror a compatible smartphone or tablet screen using the HDMI inputs. And, don't worry parents, you will still be able to control screen time through the touchscreen display on the dashboard. Packing in your passengers will be a breeze, with a flexible interior and the Nissan patent Latch and Glide technology. The second row will easily adjust as it can move 5” forward to allow third-row passengers to enter. Both the second and third row reclines for extra comfort, perfect for taking memorable driving trips. The Pathfinder seats seven people comfortably thanks to the spacious and roomy measurements of 199″ L x 77″ W x 70″ H. Even with the third row occupied, there is still room to throw cargo to haul. The Pathfinder also has a great towing capacity that tows up to 6,000 pounds. This SUV also comes with a large number of airbags, traction and stability control, and tire pressure monitoring with easy-fill tire alert. Just because you’re driving a family-friendly SUV, doesn't mean you have to compromise on style. Nissan included the Pathfinder in the nine models that have the optional Midnight Edition package. The other models that offer the Midnight Edition are the Altima, Frontier, Maxima, Murano, Pathfinder, Rogue, Sentra, TITAN and TITAN XD. This package adds visual excitement and optimized pricing with black aluminum-alloy wheels and black exterior accents. With all the features of the SL model, the Midnight Edition adds blacked-out trim, 20-inch aluminum-alloy wheels with a black finish, and comes in three color choices - Pearl White, Gun Metallic, and Magnetic Black. The front-wheel-drive Pathfinder SV stickers at $36,505 and all-wheel drive is another $1690. The add-on options include some impressive features. There are two packages you can add-on: the All-Weather package (heated and cooling front seats, steering wheel, and mirrors) for $400 and the Tech package (navigation, blind-spot monitoring, adaptive cruise control, and rear cross-traffic alert) for $1400.